Aloetouch Ice Powder-Free Latex-Free Nitrile Exam Gloves; MUST CALL TO ORDER . Aloetouch Ice� nitrile exam gloves are a housewide solution with excellent sensitivity and dependable protection. 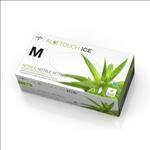 � Aloe coating helps soothe and moisturize hard working hands. � Green with textured fingertips for better grip. � Tested for use wtih chemotherapy drugs.